THE ABILITY TO CHANGE ANYTHING, CHANGES EVERYTHING. The HYDROS PRO is a true breakthrough in dive comfort and convenience. The moldable Monprene®, adjustable fit and multi-attachment points combine to make this the most customizable and comfortable BC ever. Winner of the 2016 Red Dot award for product design, the HYDROS PRO is an incredible feat of SCUBAPRO engineering, built for anyone who loves to dive. Interchangeable straps, a packable design and an included backpack with room for your entire dive kit make the HYDROS PRO perfect for any destination and any dive. Monprene® construction means ultra durability. The HYDROS PRO also stands up to UV, chemicals, and abrasion -- without showing typical signs of wear. And a modular construction makes repairs -- even from remote locations -- a snap. It's a BC for life. When you are wearing the HYDROS PRO, you won't even know it's there. The HYDROS PRO molds to your specific body shape, and has been designed with body grip gel, providing extreme comfort and stability. Near-Zero inherent buoyancy means less lead. And, thanks to a back inflation, smart air system you can dive in any position. 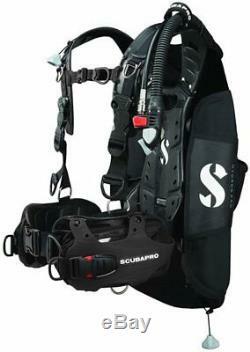 The HYDROS PRO includes both the Trav-Tek straps and a fully integrated weight system. So, with a quick switch of clips, you can transform the HYDROS PRO from a harness travel BC to an integrated weight BC. Now you only need one BC for both local diving and travel. Easily add, remove, or replace weight systems, bungees, D-rings, accessories and pockets to make the HYDROS PRO truly your own. With a wide range of mountable accessories and kits, your options are endless -- and can quickly be changed based upon the dive and conditions. The HYDROS PRO goes everywhere with you. Instant dry, lightweight and compact, with a unique smart-pack design, the HYDROS PRO also comes with a customized backpack designed to fit your entire dive kit on your back. Ultra Durable: Patented Injection Molded Monprene® Gel Harness is extremely resistant to UV, chemicals and abrasion. The fabric-free harness uses no velcro or zippers. Instant Dry: Ideal for travel due to less water retention and lower post-dive weight. "BC-4-Life" Modular Design: Customizable to add/remove weight systems, straps and pouches. Extended lifespan due to simplified repairs. Virtually every component, including buckles, can be replaced without stitching. 3D Ergonomic Design: Conforms to your body shape for maximum comfort. Lightweight: Advanced materials keep weight low. Neutrally Buoyant: Near-Zero inherent buoyancy requires less lead, resulting in better buoyancy control and much more enjoyable diving. Body Grip Gel: Prevents BC from shifting and riding up. Dual-Compound Backplate: Provides the ultimate in stability and comfort. Single tank band system allows for easier assembly. Torso Flex Zone: Auto-adjusts to your torso length for excellent comfort and freedom of movement. Articulated Shoulder Straps: Allow straps to adjust to your body shape to achieve a snug fit. Kit-Up Assist: Holds shoulder straps open for easy donning. Cross-Flow Channel: Unrestricted internal airflow reduces air trapping for enhanced maneuverability and easy deflation at any angle. 2-Stage Inflation: Tri-bungee system controls air distribution to maintain a compact shape under water and high lift capacity at the surface. Dorsal Weight-Wing: Anti-abrasion and instant dry. Buckle Weight System: Simple, safe and reliable quick-release buckles offer a fixed location for easy one-hand operation. Multi-Mount Accessory Matrix: Multiple D-Rings and mounting points for a knife + light + SMB + hoses + crotch strap and much more. Smart-Pack Design: Folding shoulder and waist straps pack into the wing, creating an unbelievably compact package for easy transport and storage. The item "Scubapro Hydros Pro BCD Large" is in sale since Thursday, November 22, 2018. This item is in the category "Sporting Goods\SCUBA & Snorkelling\Buoyancy Compensators". The seller is "kent_diving" and is located in Dartford. This item can be shipped to United Kingdom, Austria, Belgium, Bulgaria, Croatia, Cyprus, Czech republic, Denmark, Estonia, Finland, France, Germany, Greece, Hungary, Ireland, Italy, Latvia, Lithuania, Luxembourg, Malta, Netherlands, Poland, Portugal, Romania, Slovakia, Slovenia, Spain, Sweden, Australia, United States, Canada, Brazil, Japan, New Zealand, China, Israel, Hong Kong, Norway, Malaysia, Singapore, South Korea, Switzerland, Taiwan, Thailand, Chile.